What is the purpose of the Reproductive Health Act? 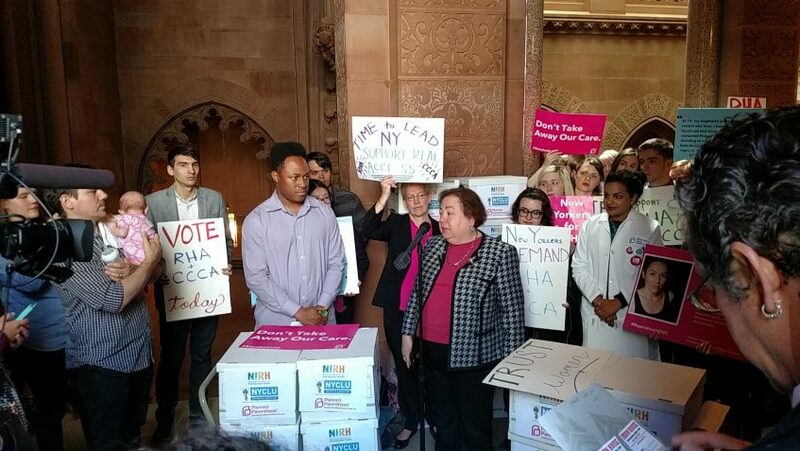 The purpose of the RHA is to codify Roe v. Wade protections into state law and ensure access to safe, legal abortion in New York State. Does the Reproductive Health Act allow any health care practitioner to provide abortion care? The RHA states: “A health care practitioner licensed, certified, or authorized under title eight of the education law, acting within his or her lawful scope of practice, may perform an abortion.” This means that some physicians and some Advanced Practice Clinicians (APCs), including physician assistants, nurse practitioners, and licensed midwives are qualified and authorized to provide abortion care. It is important to know that the RHA does not change laws that govern medical providers or scope of practice. When New York State’s 1970 abortion law was enacted, the only medical providers recognized in state law were physicians; therefore, physicians were the only medical practitioner authorized to provide abortion care. Since 1970, there has been progress in medical technology, procedures, education, and training. APCs are now established in state law and perform a range of medical services. Before the RHA, State Boards had already determined that APCs were qualified to perform certain abortion services. The RHA updated the law to reflect current medical standards of practice. APCs are highly skilled professionals, and their qualifications and scope of practice are determined by experts, just like any other medical provider. The RHA does not authorize any health care providers to perform abortions who are not qualified to do so. The Reproductive Health Act legalizes abortion past 24 weeks of pregnancy if the woman’s health or life are at risk, or if the fetus is not viable. What constitutes “health” and “viability”? Health and viability are medical terms. Like other medical terms, they are not defined in our state law. In consultation with the pregnant woman, a medical provider determines whether her health is at risk, exercising medical judgment and considering a variety of factors. Some of the medical conditions that may put a pregnant woman’s health at risk include placental abruption, bleeding, placenta previa, preeclampsia or eclampsia, and cardiac or renal conditions. Viability refers to the capacity of the fetus for sustained survival outside of the woman’s uterus, with or without artificial support. Similar to evaluating a pregnant woman’s health, medical providers consider a variety of factors following medical standards of practice when determining whether a fetus is viable. Some of the fetal anomalies that may cause the fetus to be nonviable include anencephaly, the absence of the brain and cranium above the base of the skull, and limb-body wall complex, when the organs develop outside of the body cavity. Every pregnancy is different and these are complex medical situations. Prior to the RHA, New York law put pressure on doctors to wait for a medical condition to worsen and become life-threatening before being able to provide appropriate care. That is why it is medical providers, not legislators, who must make medical assessments about health and viability, following medical standards of practice and the law. What happens if an abortion results in the live birth of a baby? Due to advancements in medical practices, education, and training, modern abortion techniques do not result in live birth. Although it would be highly unlikely, if a baby was born alive, the medical practitioner and medical support staff would provide all necessary care, just as they would in the case of any live birth. The RHA does not change standards of medical practice. Any baby born alive in New York State would be treated like any other live birth, and given appropriate medical care. This was the case before the RHA, and it remains the case now. Why is it necessary to allow women to have an abortion later in pregnancy? There are women who have experienced the tragedy of learning later in a wanted pregnancy that their health or lives are at risk, or that the fetus is not viable. In consultation with her health care provider, sometimes a woman has the choice to carry to term, to induce labor, or to have a c-section without jeopardizing her health or life. In other cases, an abortion is medically necessary. Each pregnancy is different and these are complex medical situations. Abortion is part of reproductive healthcare. Therefore, a woman must be able to make the appropriate health care decision for herself based on the medical circumstances. Does the RHA allow a woman to have an abortion later in pregnancy if she is experiencing mental health issues? The RHA legalizes abortion after 24 weeks of pregnancy if a woman’s health is at risk. As stated above, in consultation with the pregnant woman, a medical provider determines whether her health is at risk, exercising medical judgment upon considering a variety of factors. One of many factors considered is the woman’s mental health. Often the minimization of mental health issues as a justification for abortion is used by opponents of abortion to denigrate both women and health care providers. It is a myth that women seek abortion care later in a pregnancy for frivolous reasons, or that doctors would provide abortions in those circumstances. I’ve heard that the RHA allows the fetus to be aborted up to the moment of birth. Is that true? The RHA does not permit abortions to be performed up to the moment of birth, nor do women decide to have an abortion up to that point. Misinformation about the RHA seeks to convince people that after women have gone into labor, which could last minutes, hours, or days, they decide to have an abortion. This is simply not accurate. Furthermore, this is a false representation of medical standards of practice, as well as the ethical guidelines and laws that medical providers must follow. When abortions are performed later in pregnancy, it is because they are medically necessary due to the fetus not being viable or the woman’s health or life being at risk. Fetal anomalies are frequently detected during the third trimester and medical conditions that put a woman’s health at risk can occur at any time during pregnancy. If a woman’s health or life are at risk during labor or delivery, medical providers will work to save the lives of the woman and the fetus. Who determines what education and training are required to be a qualified abortion provider? The New York State Education Department is the regulatory agency that oversees licensure of health care professionals, including educational and training requirements. If a woman’s pregnancy is ended as a result of domestic abuse or assault, will she have legal recourse to seek justice? Violent attacks on people are a heinous crime, and the loss of a wanted pregnancy is tragic and devastating. The RHA does not change the ability to charge and sentence perpetrators of such crimes appropriately. Before the RHA, first and second degree abortion charges carried a penalty of 2-7 and 1.5-4 years respectively. Physical assault on a woman resulting in the loss of pregnancy qualifies as a charge of first degree assault, which carries a much higher penalty of 5-25 years. If a woman is killed in such an attack, a murder charge carries a sentence of 25 years to life. Furthermore, judges have discretion when sentencing to increase the penalty for particularly violent or brutal crimes. Finally, additional charges may be pressed as well, such as kidnapping, depending on the circumstances of the crime. Abortion is healthcare, not a crime. Women who are attacked while pregnant are still fully protected by New York State law, and every domestic violence advocacy organization in New York State supported the RHA. Criminalizing abortion is not necessary to protect women, and causes harm to women by stigmatizing abortion care and hindering access. The Reproductive Health Act repeals section 4164 of the Health Code. Doesn’t this jeopardize women’s safety? The RHA strives to ensure women’s safety by only permitting qualified, licensed medical practitioners to provide abortion services. As with other types of health care services, these medical providers must follow medical standards of practice to ensure patient safety. Section 4164 of the Health Code was repealed because the provisions were medically and legally unnecessary, did not reflect contemporary medical standards of practice, and created a burden on the delivery of necessary reproductive healthcare. If a women is far along in her pregnancy and learns that her health is at risk, why can’t she just get a c-section if the fetus is viable at that point? If a woman learns later in pregnancy that her health is at risk, all treatment options are evaluated in consultation with her medical provider, including c-section, induction of labor, and abortion. Each pregnancy is different and these are complex medical situations that require consideration of clinical factors including the woman’s health and fetal indications. Having a c-section is not always a possible or the safest option. What impact will the Reproductive Health Act have on providers and hospitals that are against providing abortion care? New York State Civil Rights law and several federal laws allow for religious refusals to provide abortion care. The RHA does not change or interfere with these protections.